Info: This feature requires Enterprise Server version 9.1 or higher and Smart Connection 8.3.3 or higher. When using Smart Connection for InDesign to create content that is going to be published to Adobe DPS, the layouts are at some point converted to the Adobe .folio file format. In order not to take up valuable time by generating folio files at moments when this is not really necessary (such as at the beginning of the creation process), folio creation is only done when a layout is checked-in while no folio is created when a layout is saved or saved as a new version. When the layout is not converted to a folio file, a replacement folio (referred to as a dummy folio) is generated by Smart Connection and used in place of the original folio. This is done to prevent technical issues that can occur in the workflow when no folio is available for a particular range of pages in the publication. Figure: A dummy folio file is used when the original layout is not converted to a folio file. 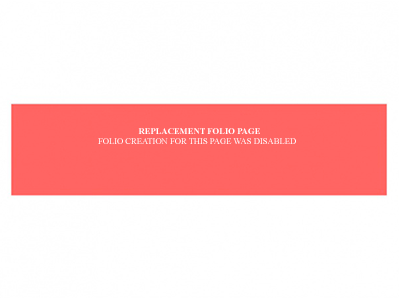 Dummy folios only consist of one page, regardless of the number of pages of the original layout. Dummy folios are cached on the local machine and are stored in the following location: \SmartConnection.noindex\DummyFolios. Once the dummy folio is created, the cached version is re-used where needed. Dummy folios are displayed in the Digital Publishing application and in the Publication Overview application in Content Station. For alternate layouts, dummy folios in landscape orientation as well as in portrait orientation are generated. Dummy folios are also included when the publication is published to Adobe DPS. Note: The Create Folio check box only appears in these dialog boxes when the layout is saved to an Issue that is part of an Adobe DPS Publication Channel. Figure: The Create Folio check box in the Check-In dialog box. Check-in dialog box: the Create Folio check box is selected by default, meaning that a folio is created unless the user clears the check box. Save As and Save Version dialog box: the Create Folio check box is not selected by default, meaning that a folio is not created unless the user selects the check box. The folio creation behavior can also be overruled by creating a custom Server plug-in. Note: Instructions for creating and installing custom plug-ins can be found in the Enterprise Web Services Guide. AUTO. The check box is only selected for a Check In action, it is not selected for a Save As or Save Version action. The user can manipulate the check box as needed. ON. The check box is selected by default for all three save actions (Check In, Save As, Save Version); a folio is therefore always created unless the user clears the check box. OFF. The check box is not selected by default for all three save actions (Check In, Save As, Save Version); a folio is therefore not created unless the user selects the check box. IDSERVER. 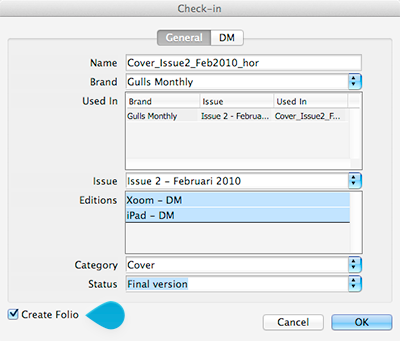 A folio is never created by Smart Connection; no 'Create Folio' check box is therefore available in any of the dialog boxes. Use this option when InDesign Server has been set up to create a folio at set moments. Note: When the custom property is not part of the dialog response, Smart Connection will use the AUTO setting.